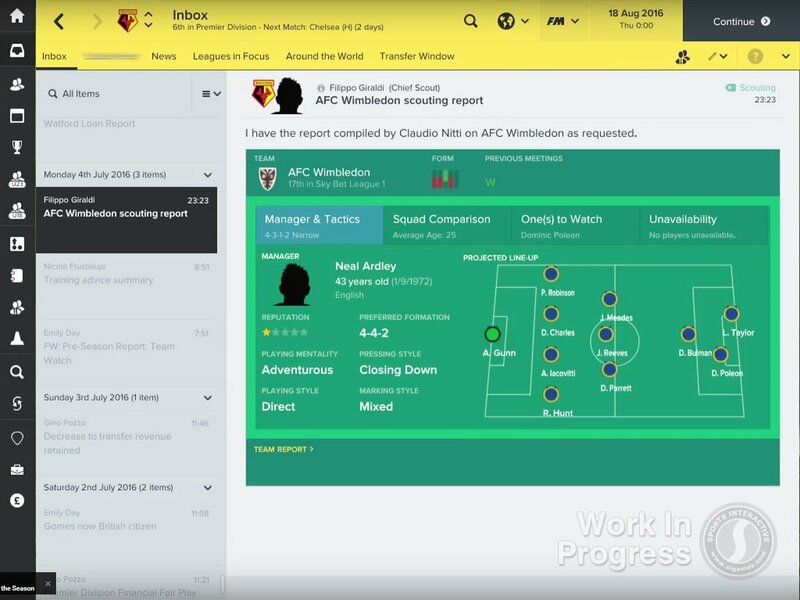 Here is the complete list of all the new and improved Football Manager 2017 features. Last updated on October 16th. There's now a 64-bit version of the game alongside the old-school 32-bit version, which allows the game to run quicker and utilizes much of your computer's memory as possible. If you have an operating system that can handle it of course. 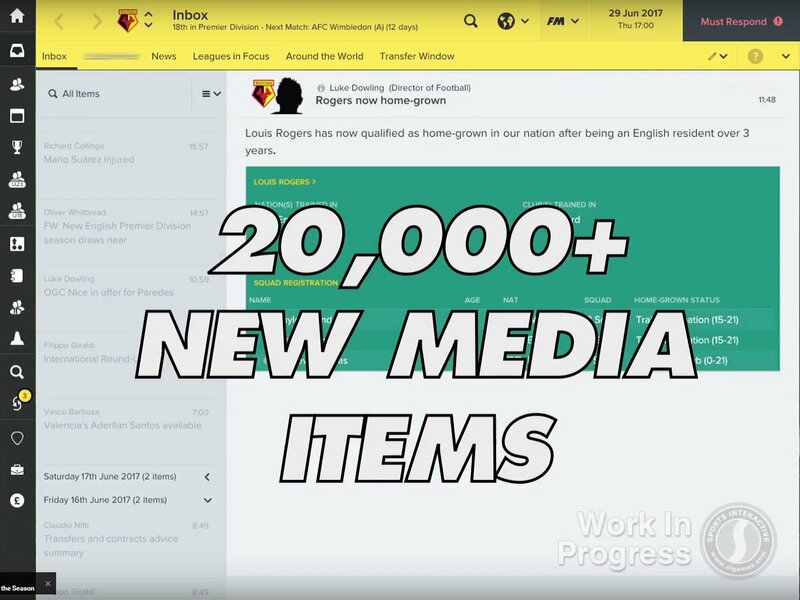 On the new dedicated Social Feed tab, you'll see fans the media, clubs and competitions sharing the news and views on the hot topics in your footballing world. Will they be delighted with your transfer business or start to put the pressure on you after a particularly poor set of results with a carefully worded hashtag. - It's part of a wider revamp of news and inbox. The social feed is the new home of fan polls and reaction to the big stories, as well as the place where major news stories are broken and transfer rumors start to sprout. - You'll even see posts containing video links to multiple goals which you can view in a pop-up player. - Your personal assistant will set up some recommendations for you to follow, but you can also add clubs, competitions and players to follow yourself. - When starting a new game you'll be able to choose between advanced and Quick Start modes. - Quick Start mode is a streamlined way to pick your team and the leagues in your game. 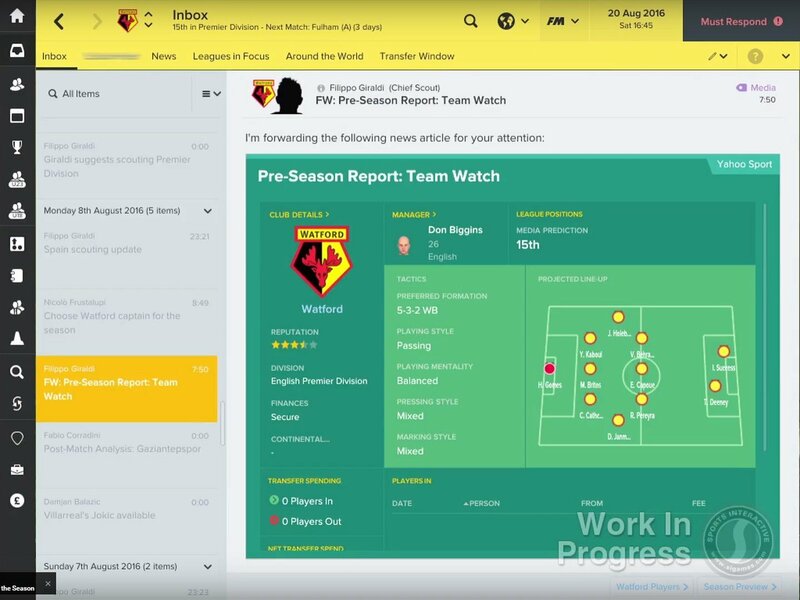 - The Quick Start mode uses recommended leagues depending on what team you select to get the best database setup tailored for you and your club and your computer. - Added new staff roles, specifically data analysts and sports scientists. 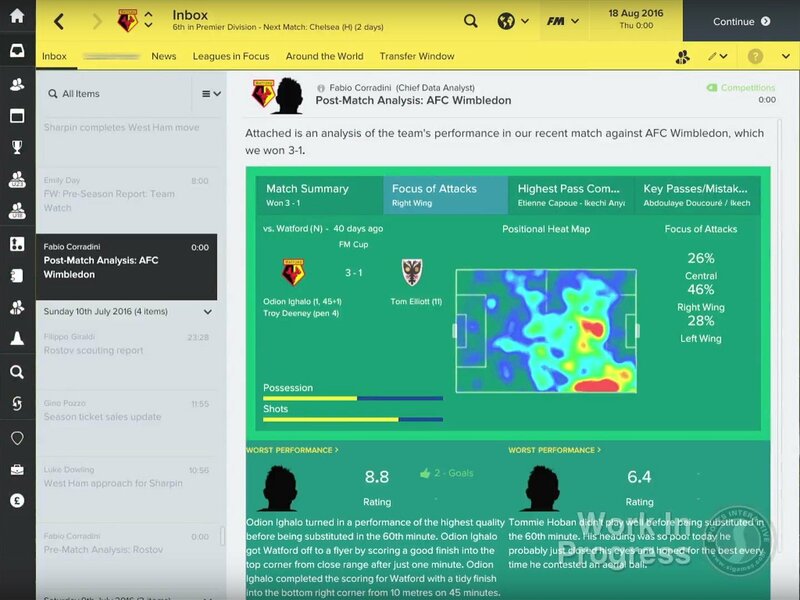 Data analysts form part of your scouting team and will provide you with detailed pre and post-match reports, looking at tactical trends in your positions previous matches, as well as your own performance. Sports scientists support your medical team and work to reduce the likelihood of injuries reoccurring. - Your assistant manager will give you his recommended formation which you can view on the tactic screen under the formation drop-down menu. - Your physio will highlight how injury-prone a player is after they've assess them in the medical. - Back room advice is now spread across the game rather than just being placed on a single screen, with relevant staff members providing contextual advice to the area of the game that you're looking at. 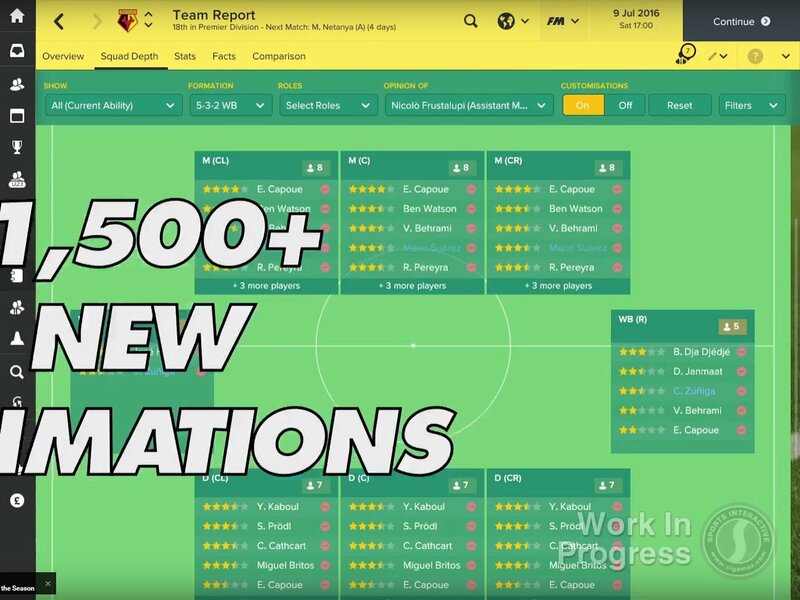 - Back room advice now covers more content, including suggestions on how to deal with unhappy players, as well as more detailed feedback and the ability to apply all of the recommended advice. - Some players now start their coaching badges before they're retired, if they're thinking of staying in the game once they've hung up their boots. - Improved player's decision making and reactions. The number of decisions a player makes per second has been doubled, meaning players are more aware of the situation they're in and the options are them. This leads to more split-second decisions. - More than 1500 new player animations, using motion-captured elements by Creative Assembly. This allows goalkeepers pulling off spectacular saves and players head the ball and shoot in a much more intuitive manner. - Players move more fluidly than before. That is a result of enhanced player models with more bones to give them a more natural movement as it allows for a more comprehensive set of movements and also lets the players change direction quicker. - New camera angle "behind the low". From this angle you can see the trajectory of the ball as long-range efforts fizz into the back of the net and get a good view of how your team is maintaining its shape. - Better pre-match presentation. You'll see players emerging from the tunnel and lining up ahead of the pre-match handshakes, as well as going through their final warm-ups ahead of kickoff. - Defensive AI has seen a big improvement. Defenders now adapt better to the opponents they're facing. As a result they'll drop deeper when facing quick attackers, but will push up from midfield when in control of the match. You'll notice players are positioning themselves better, especially when dealing with crosses and corners. Goalkeepers also make better judgements about whether it's comfortable to rush out or stay on their line. 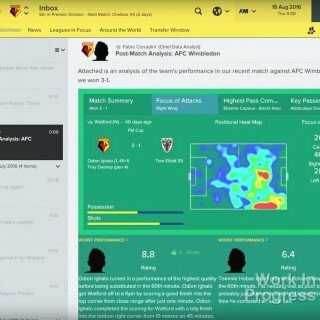 - AI managers will now use player roles more intelligently than before when picking their team and making changes during the match. - Various graphic improvements, such as refined lightning and shadows, improved stadiums with more detail, enhanced grass textures; even dynamic LED holdings for larger teams. - The commentary has been refreshed with hundreds of new and reworked lines of text and it's now more contextual. For example, you will see more detailed information about injuries suffered during the match, speculating about what the injury might be and what might have caused it. - Introduced vanishing spray. Whenever there's a free kick in a dangerous position, the referee now marks where the ball is placed and lays outline of spray marking where the wall must stand, so that can be no disagreements about when the wall is the full 10 yards back or not. - Injured player is now allowed to receive treatment on the pitch. - Law changes to deny a goalscoring opportunity, such as a foul by the last man not being an automatic red card. - New rule that allows for one player kickoffs. 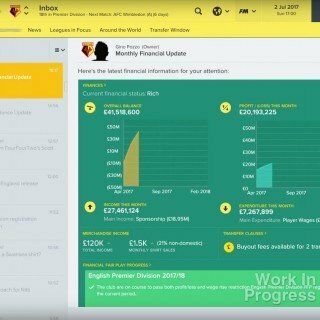 Your inbox is now the place where you receive email from your staff at your club, your board, agents and players. Anything related directly to the club will appear here. In short you'll get a lot more information by email, reducing the need to navigate away from the inbox when faced with tough decisions. - Staff members now give you their opinions on a wider variety of subjects than before. You've got a player who want to go into contract discussions, your staff will give you hints on what to do, even if they think he needs to offload the player. There's a player in your B team playing well, your staff will bring this to your attention and suggest you move him into the first-team squad. - Choosing your captain is now much simpler as you get more information within the news item, allowing you to make a quick informed decision. - You'll get more information when organizing friendly matches and when you pick your team for a training camp. - Introduced dynamic images for the first time. For example, if you sign a new player you'll now see unique tailored image of that player in your squad. - Changed the way match odds are calculated. Now you'll see dynamic odds throughout the season based on your team's performance. - Added pre-contract conversations for players who might not be that interested in joining in or who have interest from other clubs. 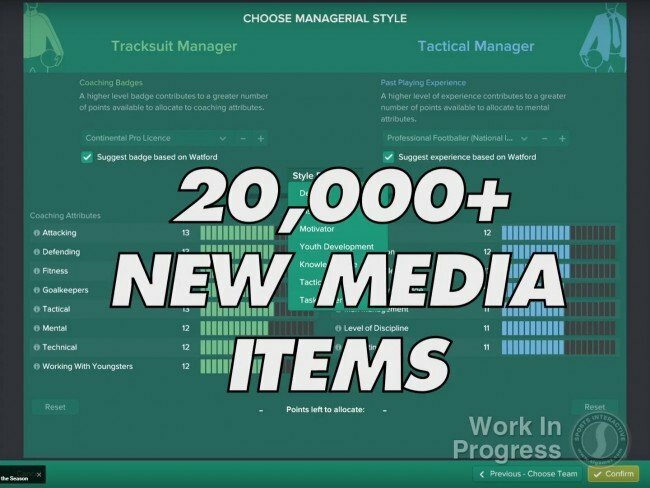 These will take place with either the player's agent or the player himself and allow you to set out how you see the player fitting into your side, their expected goals for the duration of their contract or responsibilities you want them to take on. Once these have been agreed, they'll be set as promises that you will be expected to keep. - Added the ability to adjust your transfer and wage budgets on transfer deadline day. - You'll see a greater focus on transfer activity that plays out over a long period, sometimes even for the duration of the whole transfer window. - Clubs are now more intelligent when identifying targets and may even ask for clauses to delay selling one of their players to you until they signed a replacement; or they might hold off accepting if they think they can get a better deal from another club. - Agents can be useful to managers for the first time. They now offer more detailed feedback in contract negotiations and then also get in touch with you via email if their client wants to re-enter negotiations after previous talks have broken down. - You can now arrange for your own transfer to another club to happen at the end of a season, just in case you don't want to leave your current club in the lurch. 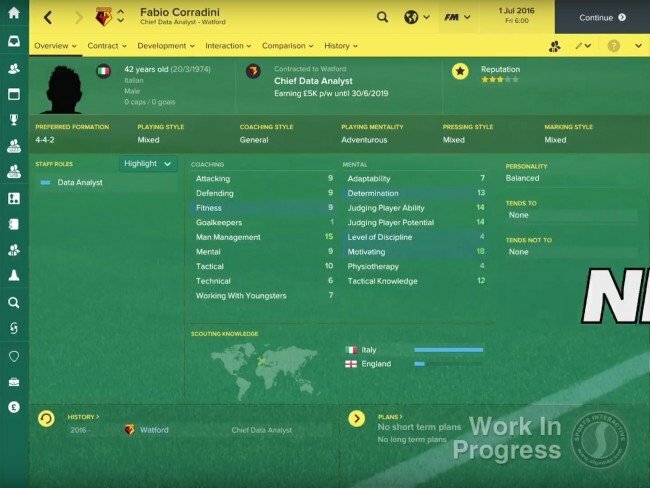 - Added a third transfer lock option that lets you agree to lock down a specific clause or bonus in a transfer deal or contract, giving you a little bit more leeway in negotiations. - Added several new clauses, including separate wage fees in a loan deal, depending on whether a player actually plays or not, minimum fee release clauses if the bidding team is involved in continental competition and mandatory future fees attached to loan transfers. - Players and agents have more power in the transfer market than ever before. As a result, you may see some players holding out for a better offer before deciding whether to sign for a club or not. - When multiple clubs are involved in trying to secure their client's signature, agents now get back and forth between the clubs to negotiate the best deal. - You can keep up to date with all the latest comings and goings on the new dedicated transfer window panel. - For very last minute transfers, you'll now get advised that a loan deal with a view to a permanent transfer could be the best and only way to get the deal done. - Added the capability to add your face to the game direct from a photo. All you need is to load a picture of yourself into the game and add some guidance points. 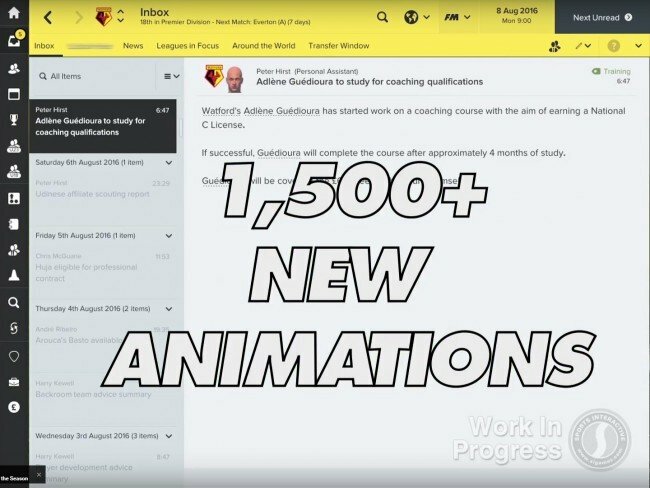 - New managers will now have more realistic reputations which will ensure that managers are picked up by clubs are realistically more likely to approach them. If you start as a Sunday league manager, don't expect any of the big boys notice you until you've achieved some serious success. 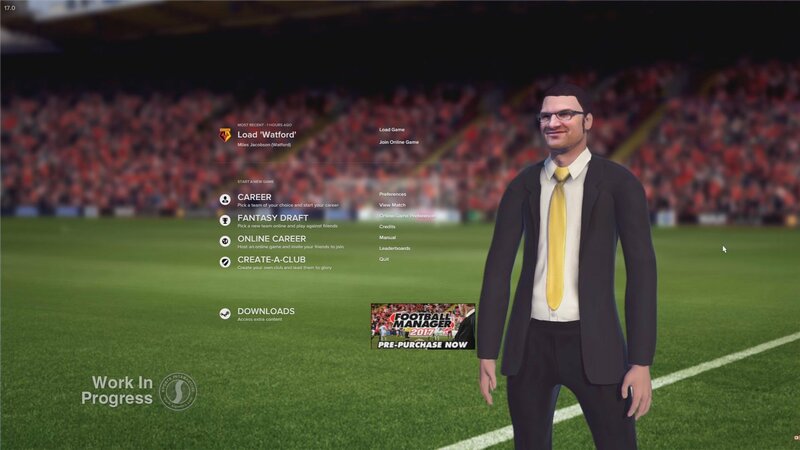 - When you load up Football Manager you'll be met with your very own manager on the Start screen. This will give you the feeling of really being within the game. - Added facial hair options and even glasses so you can fully tailor the avatar to look as much like you as you want. - Added more variety in avatar dresses, giving you more freedom to change and mold your outfit to really suit your management style. You can even change the color of your tie. - Fans will be more cynical and vocal when a manager with a lower reputation is hired. - You can now play fantasy draft just about any way that you want to; entirely on your own against AI managers, against friends or a mixture of the two. - AI managers - who make their debut this year - will have their own preferred formations and you'll be able to choose which manages to compete against. - Changed the squad budget options. You can now select to start with more incremental options up to a maximum of 250 million. - While selecting your starting budget, you can also choose to include a mid-season transfer window near draft. This gives you the opportunity to remove unwanted players from your squad and reclaim the money that they initially cost you. - You can filter out unaffordable players once you're into the draft. - Increased the size of the timer to make it easier to see how long you have left to select your pick. - Added a new panel detailing the number of players that you have drafted in each position. 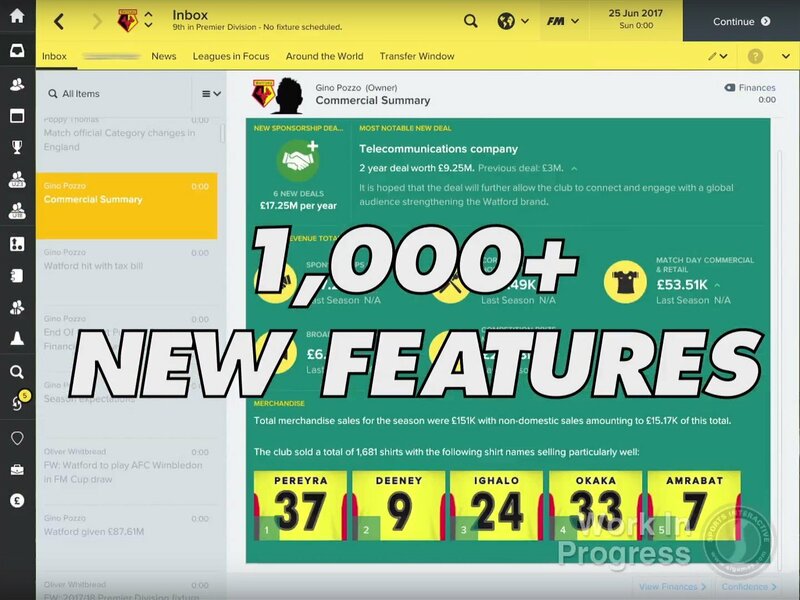 - You can now import and export your fantasy club and kit using every fantasy draft that you play, rather than having to type in the details each time you start a fantasy draft game. - Redesigned next opposition reports. These contain more information on key players and your opposition's overall ability. In addition to key stats from the competition you're facing, we've also included details on your opposite number in the dugout in the report. You can see that likely formation laid out on a horizontal pitch, as well as their likely playing mentality. - The team report panel has been revamped with the overview screen now giving you a more detailed breakdown of your team's strengths and weaknesses in the same way that you'd see in a player scout report. - Scouts will also inform you of injuries that prevent players from training full-time. It's not just for your opposition though or even other teams' players. - When scouting a player you now receive the highlights package of the player in action. 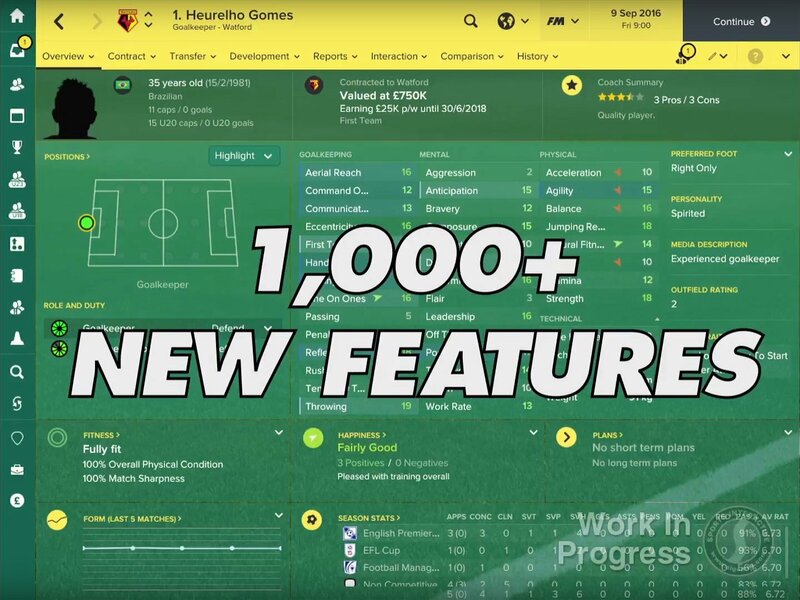 Your scout will supply this as part of his regular updates on the player, with the highlights displaying in a pop-up player. - The squad depth screen reflects your current formation on the graphical pitch display, giving an appropriate and clear view of who the strongest players are in each position. - Added more criteria to player search, such as the ability to search for the number of days the players spent in a country, which is particularly useful for finding out how long that will take a player to become a citizen of that country or a homegrown player. - You're now able to sort results by secondary column on the player search screen. So for example, you can sort primarily by value but then have a secondary sort on the players current wage. - Added a new overview screen on the analysis drop-down, where you can see a snapshot of where a game was won or lost. This screen displays heat maps of both sides and picks out the key statistical information that illustrates which formation and style of play was more effective over the course of the 90 minutes. - Added some new events, such as seeing where on the pitch possession was being gained and lost, or where individual touches of the ball were made. - Added a new graphic on the action zones screen to show the focus of attacks during the match. - Added in assists as a selectable category, so you can see how that perfectly timed pass came about. - Added new and more contextual questions in press conferences, related to match events, transfers, player happiness and injuries too. - Other teams' managers will chime in with their own opinions, extending the life of the narrative and creating extra drama. - Enhanced and more versatile personality traits. A player's ambition, loyalty, determination and professionalism, amongst others, have an even larger bearing on how successful they will be throughout their career. - Improved progression modelling. More attributes now start to decline as a player enters the twilight of their career as they would do in real life. The algorithms used to judge a player's decline have also been significantly improved to take into account things such as club's training facilities, the amount of first-team football he's been getting, and how long he's been playing first-team football for. 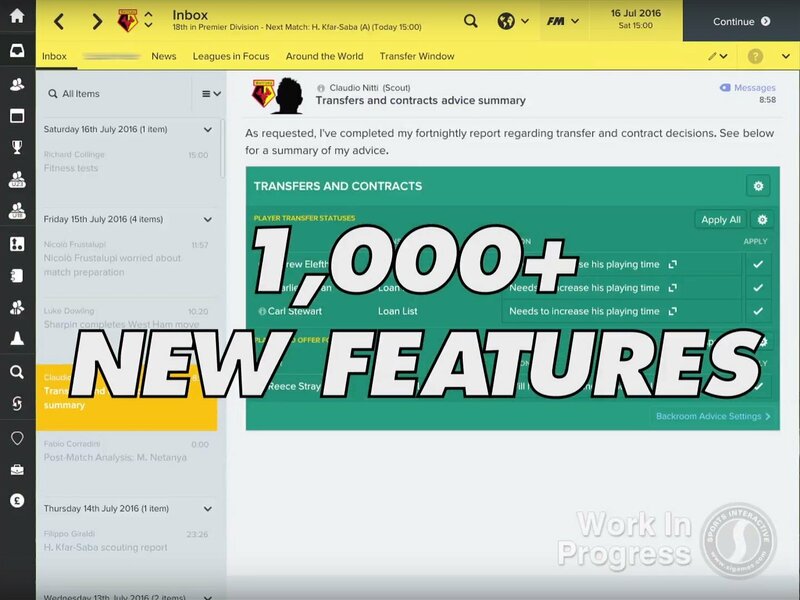 - Players can now approach you and tell you they want to join a specific club, even if another team is interested in them and likely to make a higher value offer. - Players can also conduct exclusive interviews with the media to try and force your hand if they're unhappy about a particular issue. - Revamped the player and staff comparison screens. There's now a lot more information on the overview screen, including star ratings and a clickable coach report as well as their season stats. - Added the ability to add more creative players to your squad. Now you can put together a full squad of you and your mates and lead them to glory. - Brought in the ability to search for specific players for those of you that prefer to work with real players. - Boards now behave in a more dynamic and realistic fashion and work more closely with their manager. The board come to you more often than they used to and will want to discuss a range of topics, such as contract offers, budget adjustments and changes to the size of your staff. - Revamped the "interact with board" option on the transfer offer screen. In the right circumstances, boards will be willing to part with their hard-earned cash on a player they've identified, especially if it's a marquee name. - Sugar daddies now operate more realistically. They're now dynamic which means that they'll change the type of investment they put into the club as their team moves up or down divisions. - Added a new type of sugar daddy. Underwriter who expects return. This type of sugar daddy will take over a club outside of the top flight with good prospects, even if they have some sort of debt. They will then pay off that debt with a loan that will have to be repaid if the club reaches the top division, as well as taking profit out of the club over the long term. 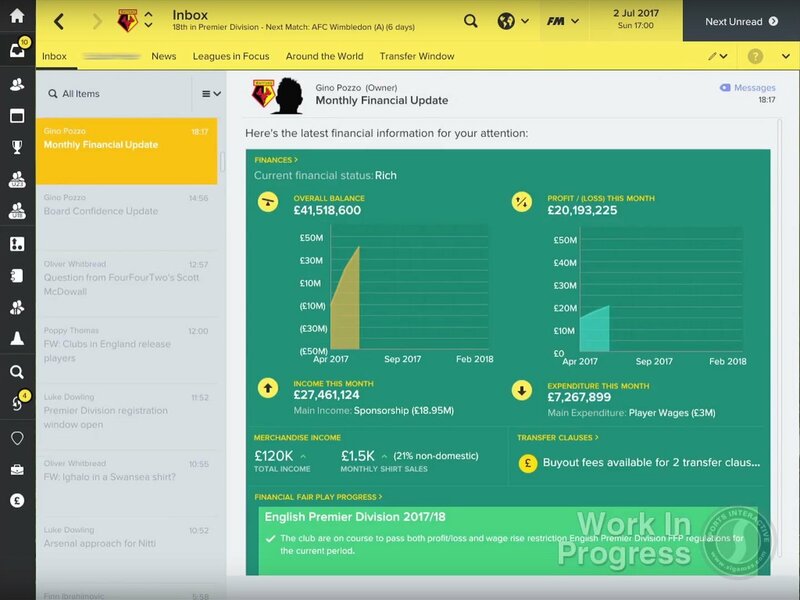 - You can now negotiate existing partnerships to ensure you're getting the most out of the arrangement for your club. - Tycoons now use more advanced logic when choosing a club for a takeover. - Some chairmen will also seek your opinion on budgets and the club's facilities after a takeover. 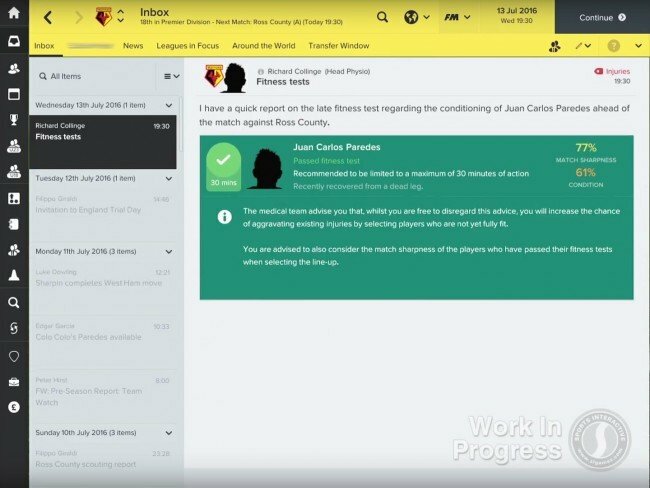 - The board will also give you more input on your relationship with affiliated clubs. - Brand new licensed league; the Polish Ekstraklasa. - On the club's history screen you can now see every single player who has played for your club, arranged by season with details of where they are now; perfect for those of you enjoy long-term saves. - The club history screen also features plenty of new records, including the most goals in all competitions in the season, the most clean sheets in the season and the most wins in a season. - Added pre-season odds for awards such as top goalscorer and player-of-the-year. - Newgen names have been tweaked and they now feature double-barrelled surname to reflect the way things are in the modern game and in the real world. - There are even now more naming choices for Danish newgens, which has been a problem in the past. - Revamped the Australian youth league system to reflect the new conference system that was brought in the end of last year. - AI managers in MLS are more intelligent with their selections in the superdraft, choosing players who can improve the weaknesses in their squads. - Kosovo and Gibraltar have been added into the qualifying groups for all international tournaments that they are eligible to compete in. - Financial Fair Play rules have been fully updated ahead of the new season to include a new range of embargo restrictions. - Customizable columns have been added to certain league tables, allowing you to view tables for the first and second halves of the season. - The scrolling status bar at the bottom and the processing panel has been given greater prominence with more stats now being shown. 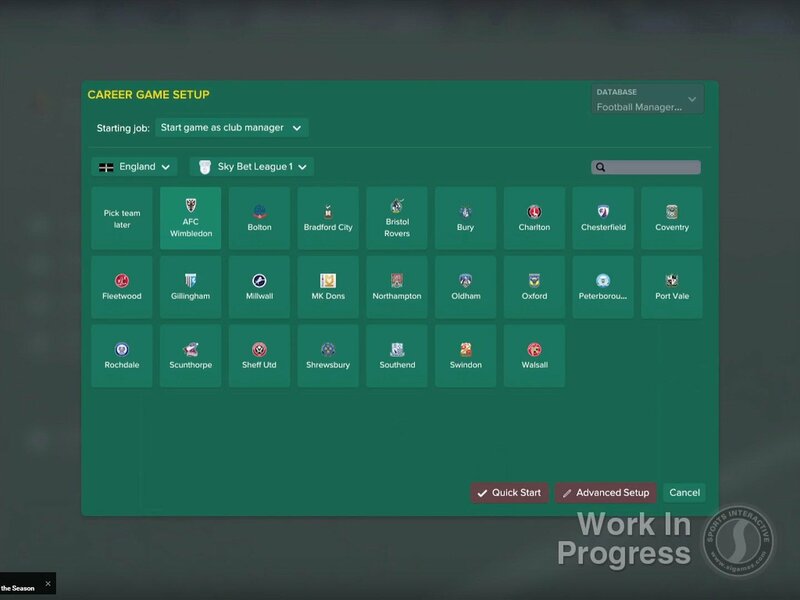 - Added a new online game preference that forces all users to have their assistant manager take control of their friendly matches, saving time during pre-season; should everyone agree that that's how they'd like to play the game. - New customizable timer that can be put in place, that gives managers a set window of time to deal with things like board meetings and submitting their squad. If you choose to use the timer, then you can also select whether you want the game to stop the time and move you past certain news items, such as job interviews and board meeting requests. - Hosts can now set a maximum number of times that their game is allowed to stop on any one day. - Quickest version yet, as new features and optimization allow you to progress through the game more quickly than before. - Added option to instant result midway through a match. The rest of the match will simulate and you'll be taken straight to the result. 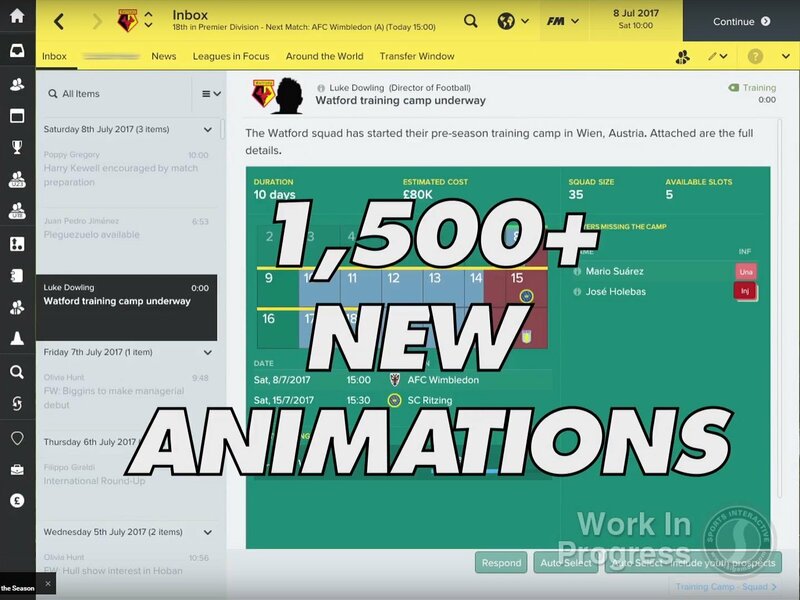 - You can delegate more tasks to your back room staff than was previously possible, allowing you to concentrate on getting the team ready for match day. - A streamlined version of the scouting assignment panel is now available, so you can see where your scouts are in the world at any given time. - The training overview screen has been redesigned to feature more graphical information. To keep the hype alive, they unleashed a first look teaser trailer on September 18th. This video is very short (30 seconds) and it's showing some 3D match footage plus a slideshow of screenshots from the new interface. 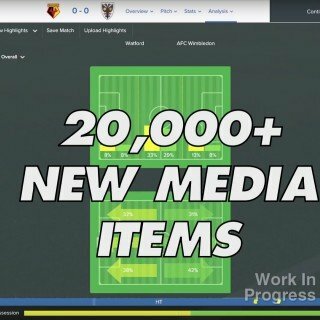 I have extracted all FM17 screenshots for your convenience. 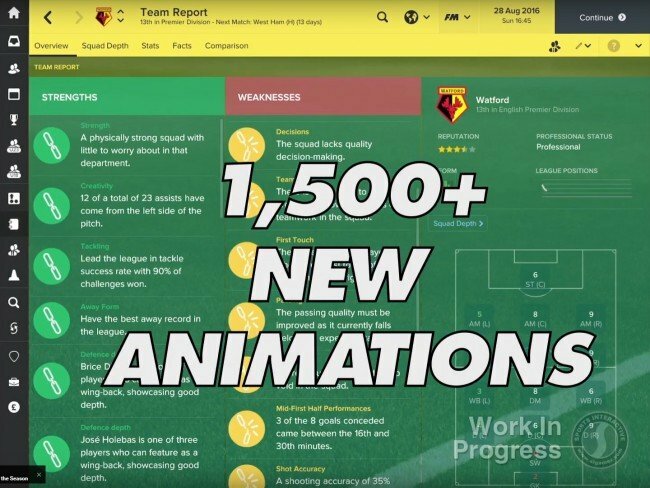 In this article I make a list of all the new and improved features I spotted by watching the video and following the official Twitter account of SI's studio director. I'll be updating this list whenever we learn something new. 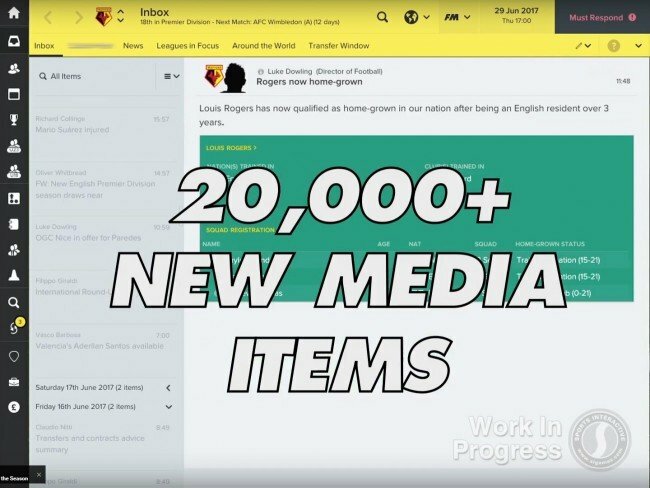 The FM17 database The updated database will boast over 2,500 real clubs to manage and over 500,000 real footballers and staff to sign. Better user interface The interface showcases certain tweaks and is more colorful than before. Improved 3D match graphics We can expect better 3D match engine graphics with more than 1,500 new player animations. 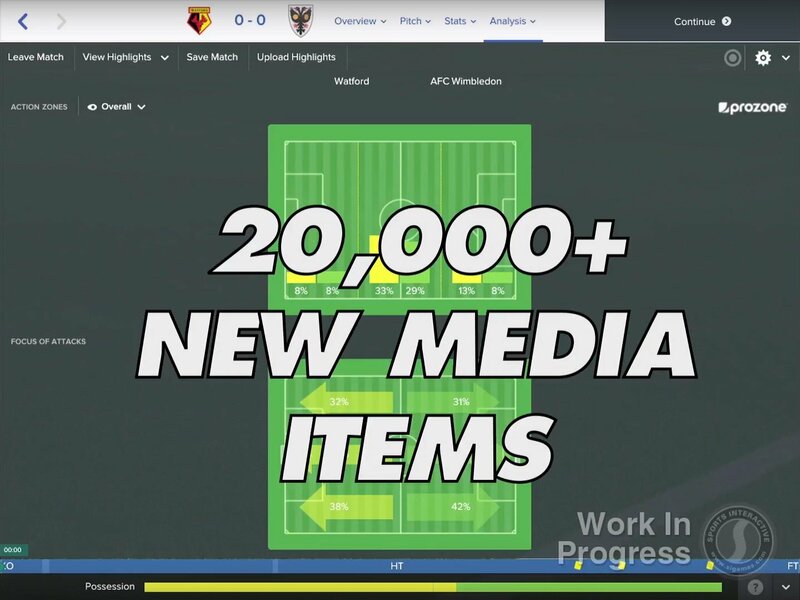 20,000+ new media items There's now a much wider variety of information arriving to our inbox. New staff roles We can see the introduction of a chief data analyst and a press officer; the latter is probably not someone you can sign. 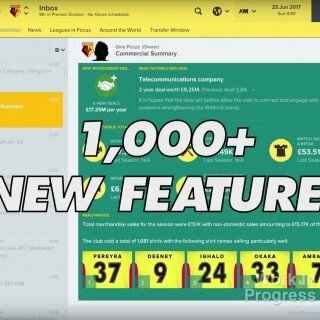 More in-depth financial insights The board (actually the chairman himself) will send you a monthly financial update (with FFP status check) and a commercial summary for sponsorship deals and other revenue sources. Overhauled Team Report You can now see strengths and weaknesses for your team as a whole. Fitness tests with recommendation Improved pre-match fitness tests for your players from the head physio who will provide you with the recommended minutes that not fully fit players should play. Easier to monitor home-grown players You'll be getting updates for your players who acquire home-grown status. Coaching qualifications You'll be notified for your soon to be retired players on the progress of their coaching courses. Managerial style focus Added a new style focus option when choosing your managerial style. It should be like presets for points allocation to save you time. Revamped the game setup screen(s) There's now a more intuitive club selection screen for people who are not comfortable with the (previously) advanced setup. Revamped squad depth screen We see UI tweaks and some new options on the squad depth screen. More match stats Added even more match stats powered by prozone. Transfer and contracts advice You will now receive actionable help from your scout(s) related to transfer and contract decisions you need to make. Training camp You will receive certain details about the pre-season training camp of your team and be able to select a squad for the camp. Social media? There's a blurred out tab next to "inbox" that could be potentially be "social media". 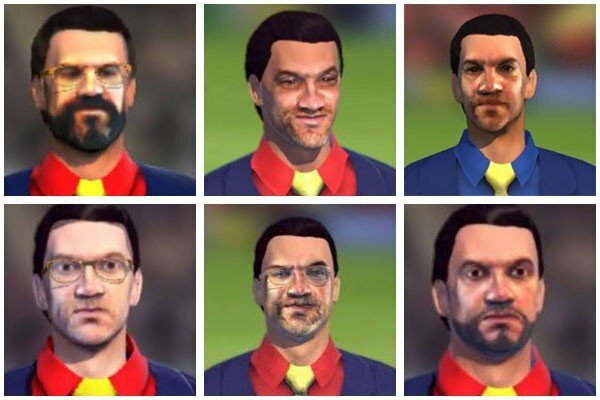 Evolved manager avatar We can assume the manager avatar creation has been improved, most likely with an option to scan your face (judging from Miles' Twitter profile pics). Stranica je generirana za 0.149 sekundi uz 33 upita.